SPITTLEBUGS WILL KILL YOUR GRASS! Spittlebugs are closely related to aphids. Like aphids, spittlebugs rely on the nectar or sap of plants for food. The two-lined spittlebug is the most common species though several exist in the United States. They range from dark brown to black with some having two distinct lines across their backs. Others can be mostly orange or even red. Commonly known as froghoppers, spittle bugs will usually be either the Meadow, Dogwood, Saratoga or Diamondback spittlebug. Though spittlebugs look like a moth, they are really a close relative of the aphid or cicada. They are small, about 1/3 of an inch fully mature, and local infestations will easily reach hundreds to thousands if left untreated. Spittlebugs feed by extracting plant sap. A little bug shouldn’t be able to adversely affect a large plant and if spittlebugs were efficient feeders, this article probably wouldn’t be written. The author says this because if they were efficient, they would probably go about their business without causing much if any damage to their host plant. But as nature would have it, spittlebugs are extremely wasteful when they eat and this waste is what makes them a damaging pest. Spittlebugs lay eggs which will overwinter in harsh environments waiting patiently for spring. When the temperatures warm, eggs will hatch and the young will begin to feed. It takes 1-2 months for nymphs to mature and during the summer, adults will lay eggs every 2-4 weeks. In damp, humid conditions, populations will soar if left untreated. However, it is not easy to see spittlebug damage when it is wet and moist. It is during this time that they can lay hidden in the wet, healthy grass and remain unseen. But as soon as conditions dry and the local grass is put to the “health” test, spittlebug damage will show it’s impact. Spittlebugs will eat a wide range of plants. But its mostly the turf they infest which gets noticed. In fact any lawn which has provided spittlebugs safe harborage will deteriorate rapidly when stressed. So as cool temperatures and rainy days mask the damage they do in the spring, this will all change when the summer season takes hold. This is due to how spittlebugs feed. As mentioned before, spittlebugs feed on the sap of grass and other plants. Now if they only ate what they need, most plants would barely notice the impact from any local populations. But spittlebugs feed in a rather unique way. Nymphs will huddle up close to one another and using their piercing mouthparts, puncture the plant stem on which they are feeding. Plant sap is then pumped out and through their bodies at an alarming rate. This pumping will many times form a sap “foam” around their activity. 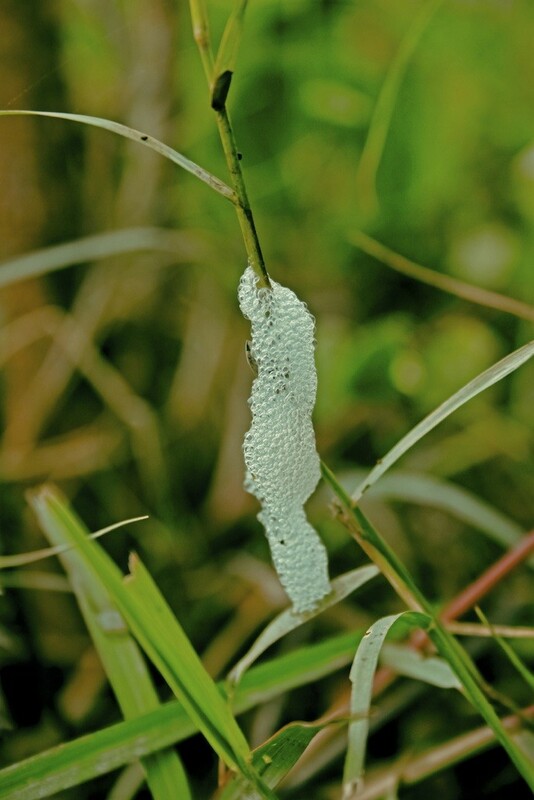 So if you’re finding these balls of foam on your grass or ground cover, its a sure sign of spittlebug activity. Spittlebug larvae feeding will extract a lot of sap which then accumulates around the group of spittlebugs as they feed. Since the sap is thick and gooey, it clings to the spittlebugs and forms a type of sap or “spittlemass” in which the nymphs thrive. This moist, sap membrane is both a food supply and a place of safe harborage for the nymphs. Predatory birds and other animals are likely to overlook nymphs encased in the spittle; the mass provides a damp environment for the vulnerable young so they’re better able to endure even the hottest of days. Unfortunately, the infested grass cannot handle this activity! If left untreated, the impact of spittlebugs feeding will result in dead turf. 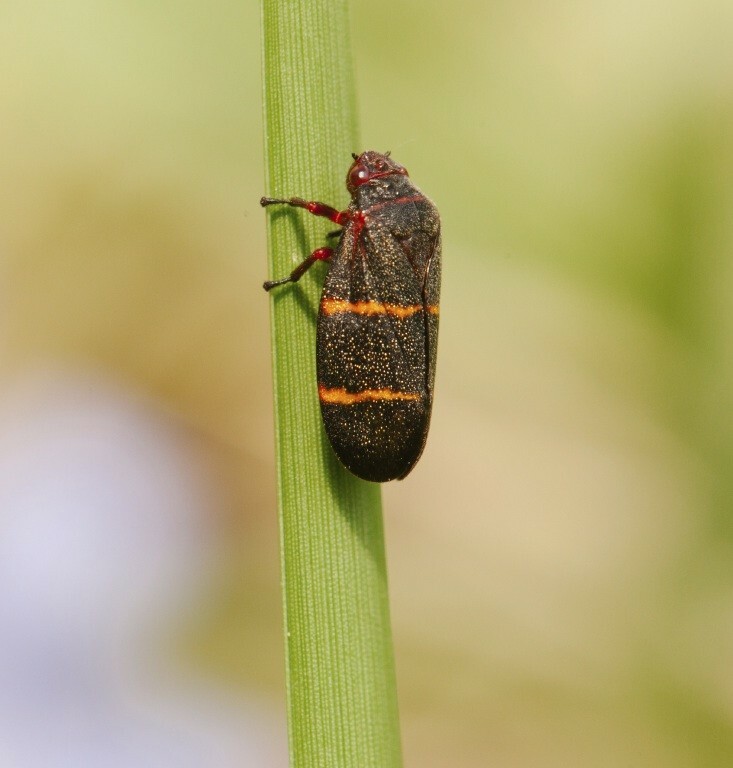 Though you may only see a few spittlebugs take wing as you walk through your grass, it is very likely a lot more “activity” is happening down in the grass stems. It is here, deep down near the nap of the grass blades where eggs will rest and nymphs will thrive. A close inspection will often times reveal tiny spittle masses where spittlebug populations are most concentrated. More importantly, foraging adults will move to neighboring plants and shrubs. Over time, hollies, azaleas, boxwoods and other low lying ground cover will become targets. The common spittlebug may be small in size but their numbers can cause damage so don’t ignore their presence. Fortunately, spittlebug management is easy. Since they are nesting right there in the grass, you don’t have to worry about “where”. More importantly, they’re easy to target. In fact a good combination of liquid and granular material will knock them down and keep them down. In most situations, just two applications will be needed to get local populations under control. And you should see results in just 1-2 days. So for light infestations on turf where the grass clippings are being removed, a liquid alone will probably do the trick. For small yards (5,000 sq/ft or less), CYONARA RTS is a good choice. This concentrate is odorless and comes with its own hose end sprayer. 1 Quart can treat up to 15,000 sq/ft so for any yard 5,000 sq/ft or less, a quart will be enough to treat at least 3 times. For yards larger than 5,000 sq/ft, consider getting BIFEN XTS. This concentrate will work faster and you only need 1 oz per 5,000 sq/ft. Use a good HOSE END SPRAYER to apply the Bifen since you need plenty of water. 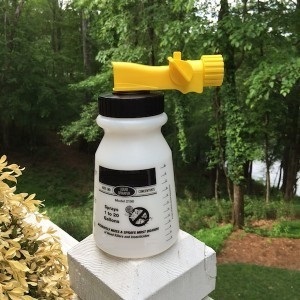 With our sprayer, add 1 oz of Bifen and fill the sprayer up to the 5 gallon mark. This means you’ll spray out 5 gallons of water to apply the tank solution and this amount will cover up to 5,000 sq/ft. If you have a larger yard, say 10,000 sq/ft, add 2 oz of the Bifen an fill the sprayer to the 10 gallon line. Use the entire tankful to cover the 10,000 sq/ft. If you like to leave your grass clippings, liquid alone will not do the job. Grass clippings will “cover up” spittlebug eggs and other stages. For this reason you’ll need to treat the thatch with DELTAGUARD GRANULES first and then spray over the top with either the Cyonara or Bifen. Granules insure the spittlebugs can’t avoid the treatment. Since spittlebugs tend to burrow deep when it gets hot, granules may be needed to reach them. This is especially true if you water a lot and have healthy topsoil. Use 1 lb of Deltagard granules per 1,000 sq/ft of turf and reapply once a month for at least 2 months. Deltagard will control a wide range of insect pests and its a good idea to use them 2-3 times a year for general pest control. Spittlebugs are a significant threat to most any moist, green yard. Once established in your turf, they will forage to neighboring plants. Populations will grow and by the time the damage is noticeable, it will be more extensive then immediately visible. To avoid this scenario, be sure and treat when they are first found. If you address the problem early, liquid treatments will knock them out. Once established and embedded in turf with a lot of thatch, apply Deltaguard Granules first and then spray over the top. Treat at least twice and monitor your grass the rest of the growing season to make sure they don’t return. Is it too late in the season to treat for spittle bugs? They fly all over while walking on the grass. Definitely not too late. In fact all you kill now won’t be able to lay eggs which in turn means you’ll have that many less to deal with next year. Get at least 1-2 applications of Bifen applied as soon as possible. It is now Oct 22, 2012 – In Northwest Florida Panhandle. Still seeing quite a few Spittle Bugs hopping around – only really noticed them a few weeks ago. Is it too late in season to treat them? Definitely not too late. Like many pests, spittle bugs have eggs and developing stages that will “over winter” through the colder months. Now during this time they’ll get active whenever it’s warm enough to come out and feed and no doubt this will happen every winter from to time. The importance of this activity is that they’ll be doing lawn damage like they are now so if you value your turf, you’ll want as many of them gone ASAP to help minimize their impact when they come out to feed. So at this time I’d get some Bifen applied. Additionally, I’m sure you’ll have plenty of time to treat again in another few weeks. Florida can have this pest active through the winter when conditions are mild enough and if we have another winter like last year, I believe they will be very active all the way through spring if left untreated.